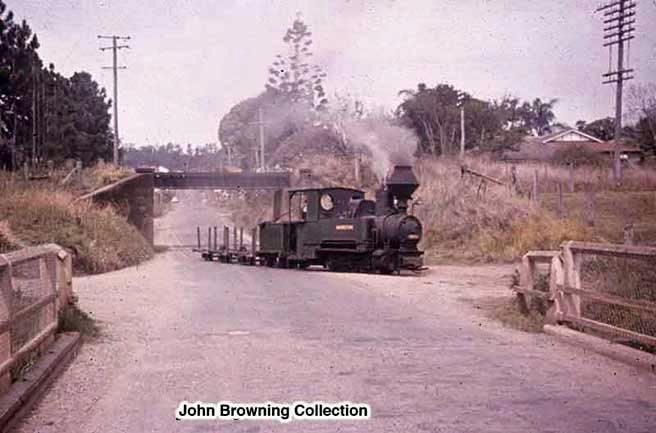 Railway historian John Browning has assembled a collection of photographs of the little steam locomotives in action. These now form a rare archive of scenes that will never be repeated. The following selection of 32 photographs is reproduced with permission. 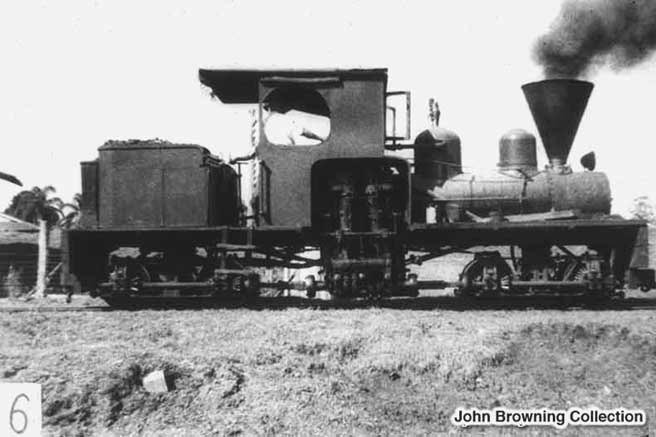 Dulong on a standard gauge flatcar, leaving the Lima factory on its way to Australia, 1908. 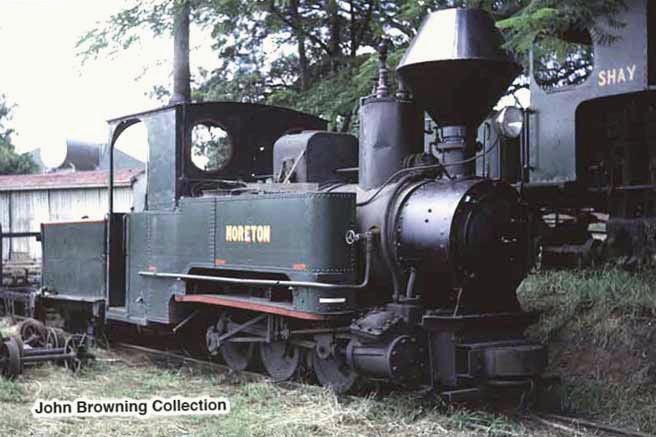 Shay is a hybrid loco, made up of the Mapleton with parts from the scrapped Dulong in 1948. Comparison of the height of the steam dome and the position of the steam pipe exiting the dome with those features in the preceding pictures of Dulong indicate that Shay has the Mapleton's boiler, but the Dulong's chimney (or a copy). 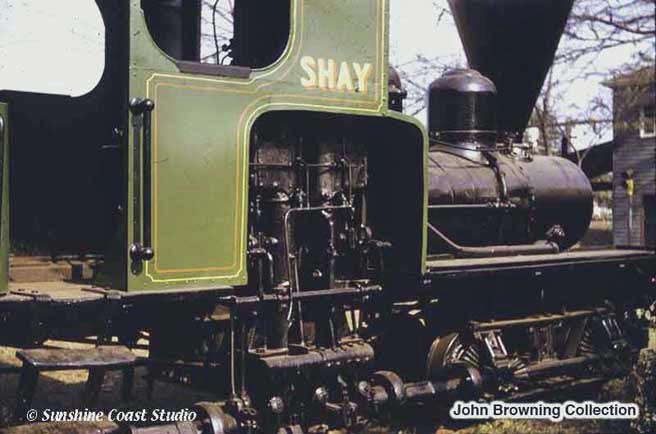 Shay with a short works train in 1957. Shay in lined-out livery just before retirement around 1960. Shay in storage in 1961. 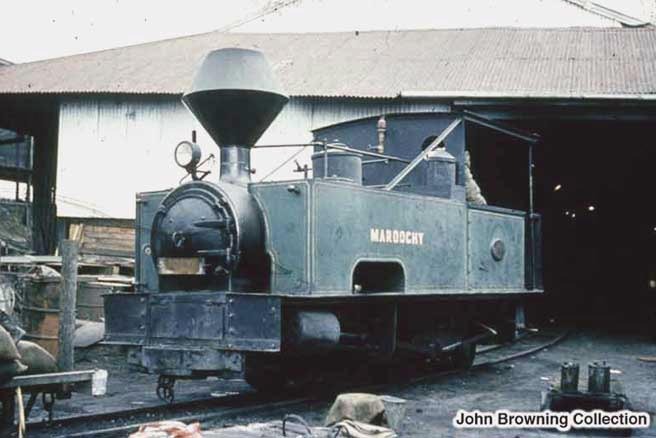 Maroochy was purchased new from Hudswell Clarke in 1914. 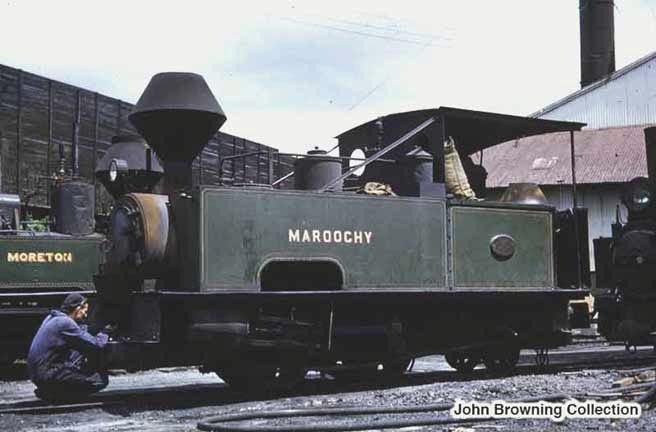 Maroochy was the most powerful of the Mill's conventional steam locomotives. It is seen here in 1960. 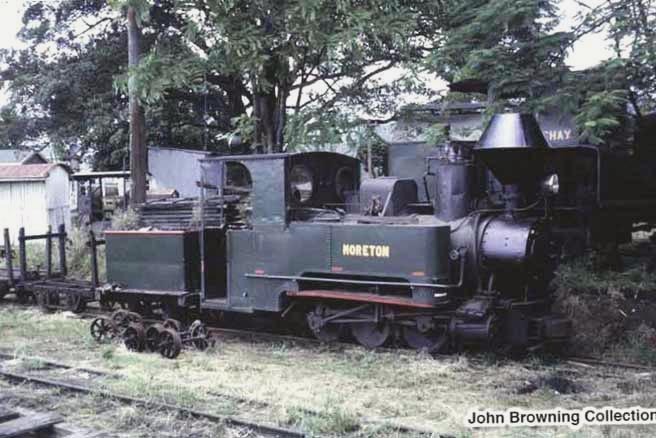 Coolum (built 1923) at the Moreton Mill in 1960. 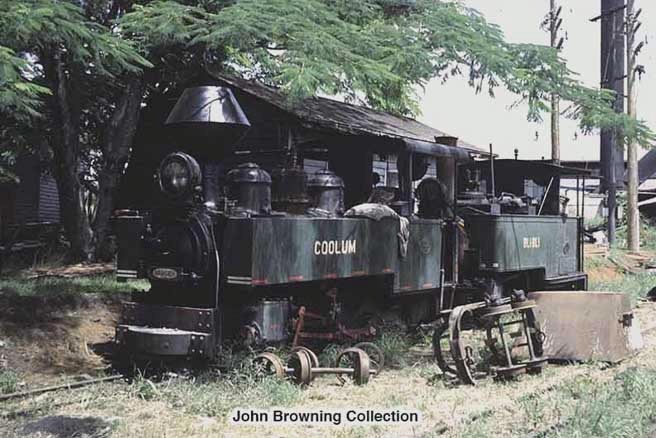 Coolum and Eudlo were identical John Fowler locomotives. Eudlo was built in 1924. 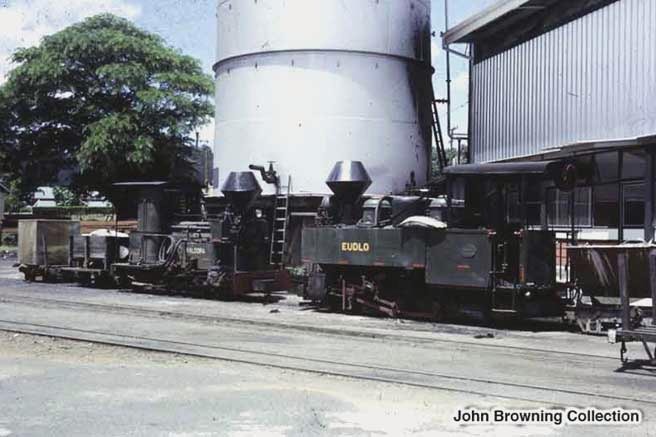 Eudlo (delivered to Nambour in 1925) outside the Moreton Mill with trucks of mill press residue. 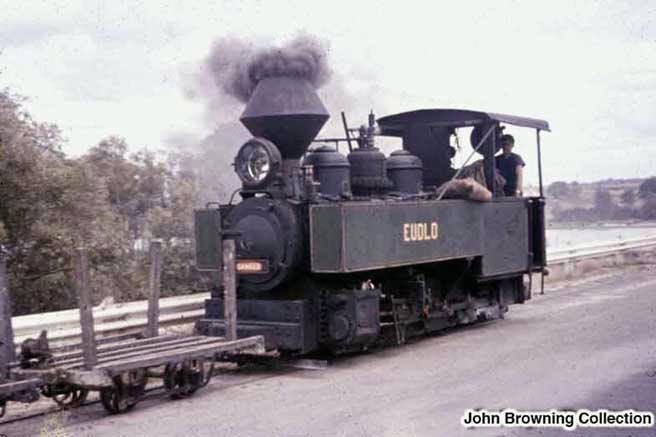 Eudlo standing light engine at the Mill in 1960. 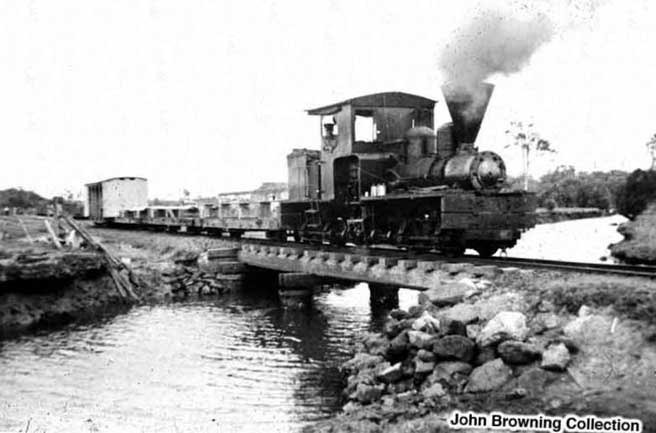 Eudlo about to cross the bridge over the Maroochy River at Bli Bli, 1961. Valdora was purchased secondhand from Racecourse Mill, Mackay, in 1937. 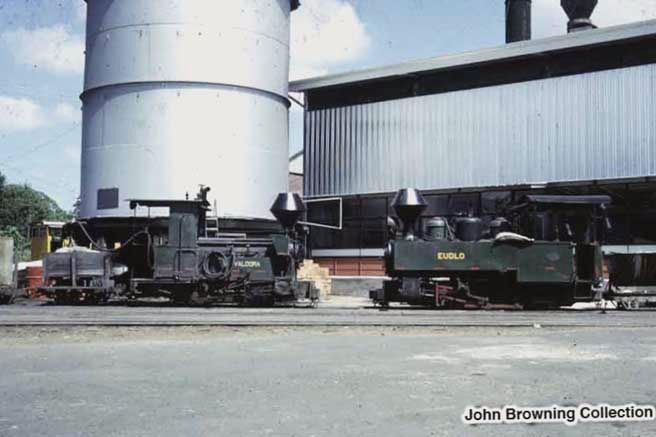 Valdora and Eudlo sit nose to nose at the Mill, 1965. 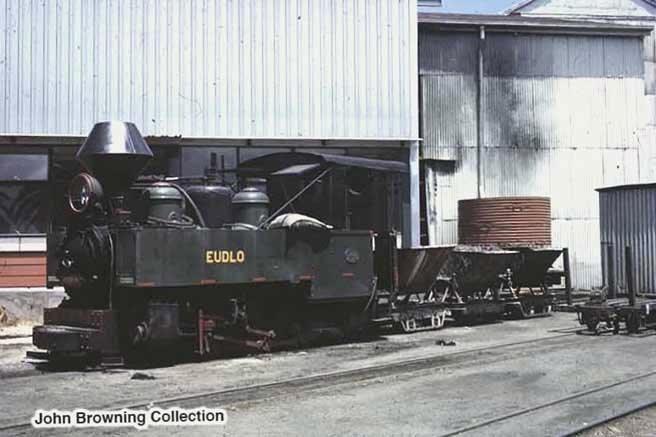 Valdora and Eudlo at the Mill in 1965. This collection of photographs indicates that, in the years 1960-65, Valdora, Moreton and Shay all faced uphill (west) when climbing Howard Street to the Mill. 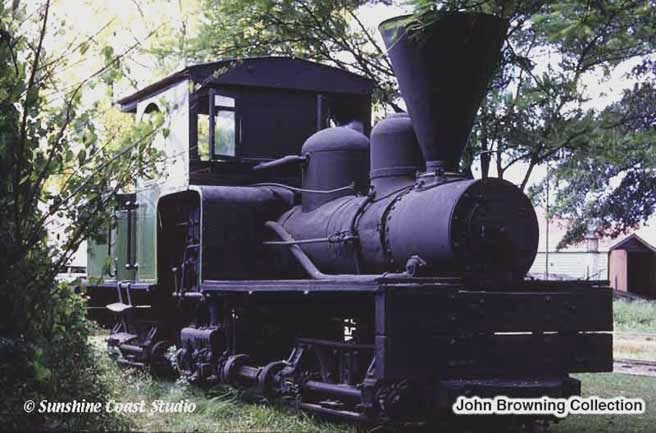 The other five steam locomotives climbed Howard Street bunker first. 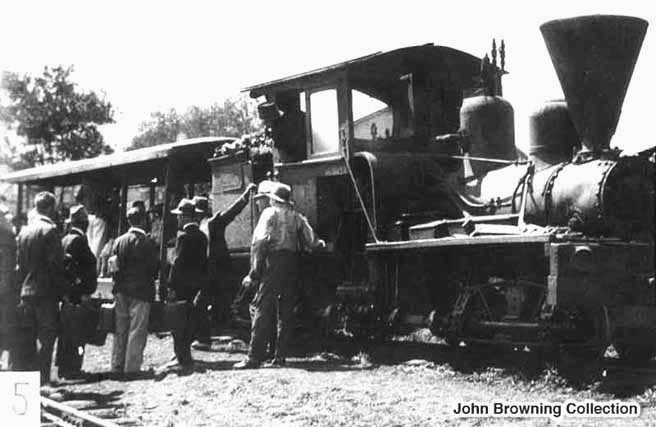 Although there was a balloon loop encircling the Mill, it could not be negotiated by a locomotive, so they could not use it to turn around. 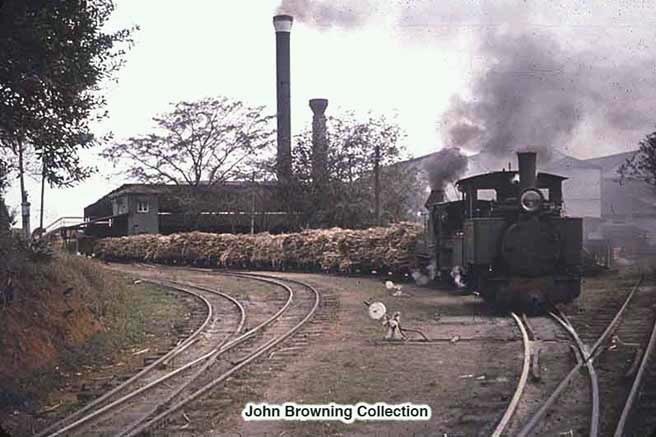 Horses were employed to drag the loaded cane trucks around the loop to the handling equipment which tipped the stick cane from the trucks, one truck at a time, into the carrier. In 1965 a winch was installed between the rails to drag the rakes of trucks to the carrier, and the three horses then employed were sold off. Later, mechanical cane harvesters replaced human cane cutters, and cane was delivered to the Mill in short lengths (billets). 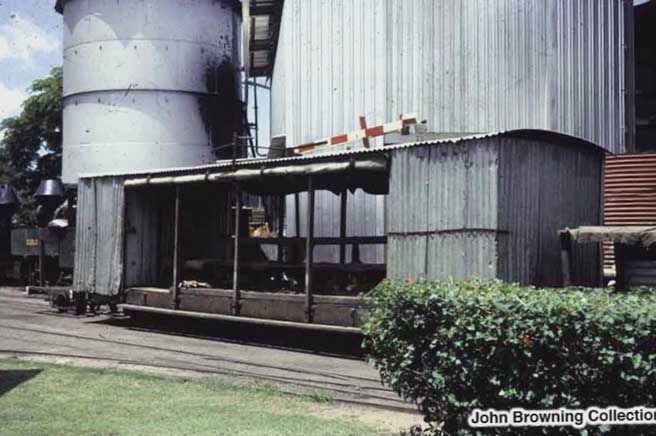 The cane trucks were replaced by four-wheeled bins (still unbraked), and in 1975 a rotary tippler was installed in the balloon loop which inverted individual bins into the cane carrier for crushing. 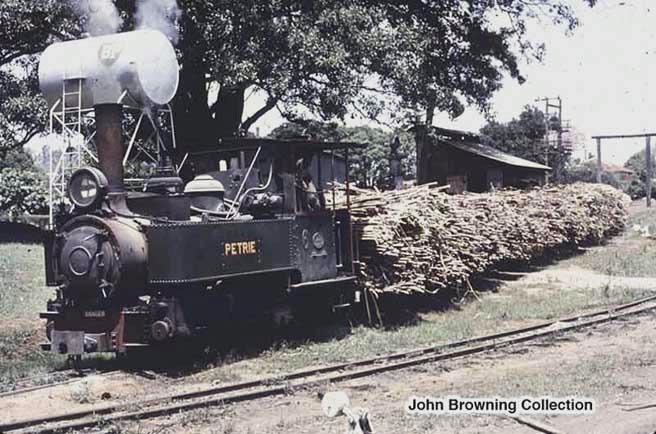 Petrie (built 1933) with a rake of cane trucks loaded with stick cane. 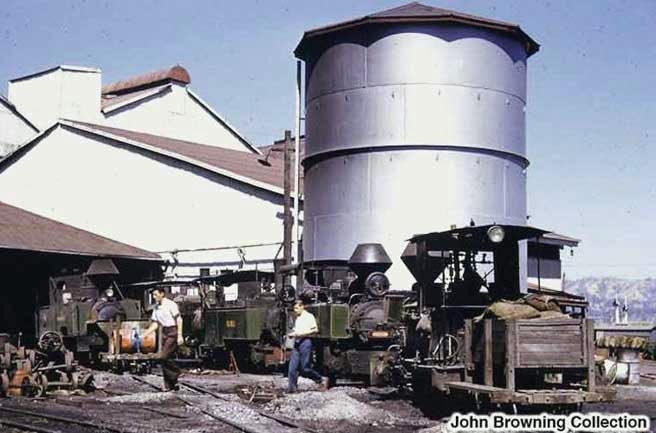 Bli Bli and Moreton pushing cane trucks into the Mill for unloading, 1961. 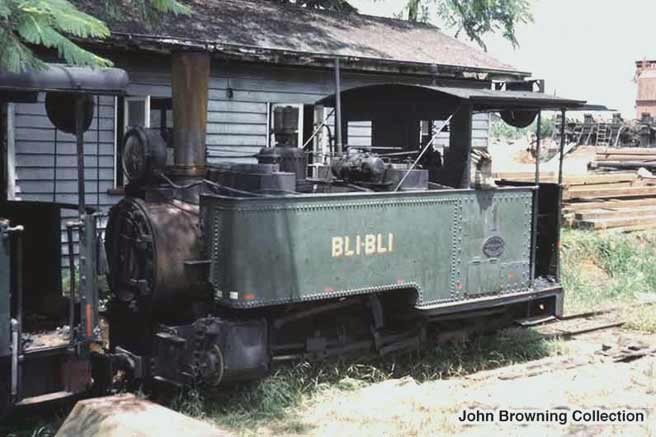 Bli Bli was purchased secondhand in 1960, is seen here in 1965. At the Moreton Central Sugar Mill, from left to right: Maroochy, Petrie, Bli Bli, Coolum and Valdora. 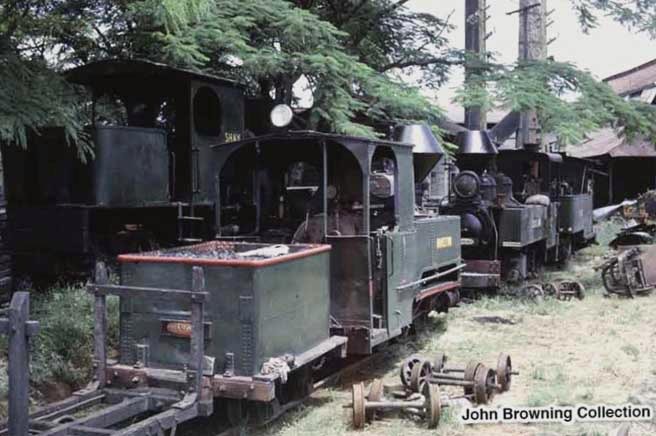 Moreton, Coolum and Bli Bli (front row) with Shay on parallel track, 1965. In the background is the Mill with the two chimney stacks it had at the time. 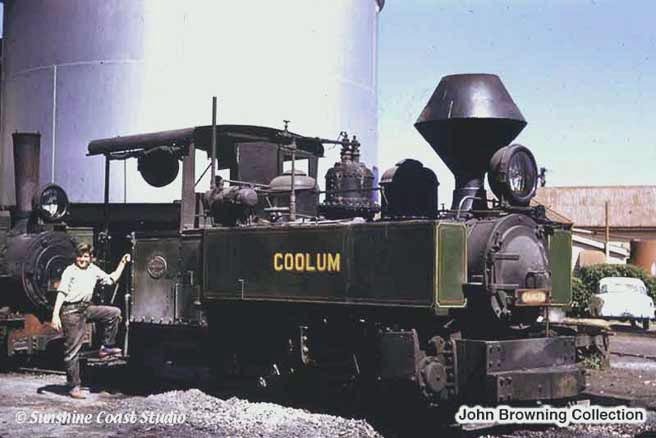 Coolum and Bli Bli at the Mill in 1965. 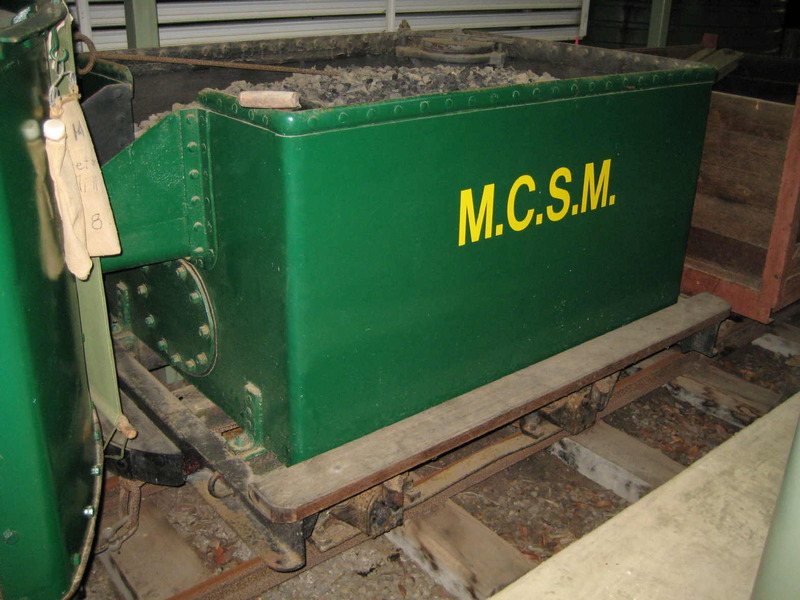 A bogie carriage used by the Mill to transport navvies and their equipment, 1965. 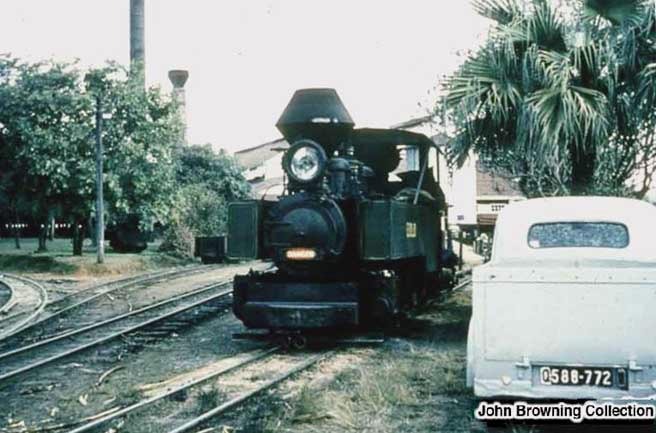 This was always said to be an ex-Mapleton car, and was possibly a conversion of a Mapleton Tramway guard's van. It does seem rather long. 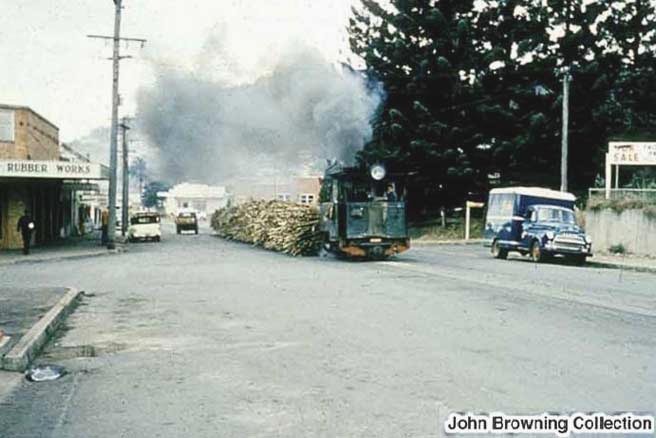 Moreton takes a few empty cane trucks under the QR rail bridge, and across Arundell Avenue, heading for Burnside, 1961. Bli Bli brings a load of stick cane up Howard Street, past the Sydney Street and Anne Street intersections. 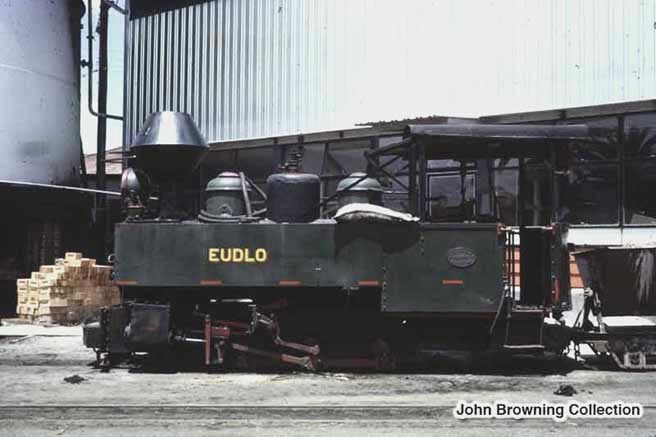 Eudlo approaches the Currie Street intersection after climbing Howard Street from the marshalling yards. 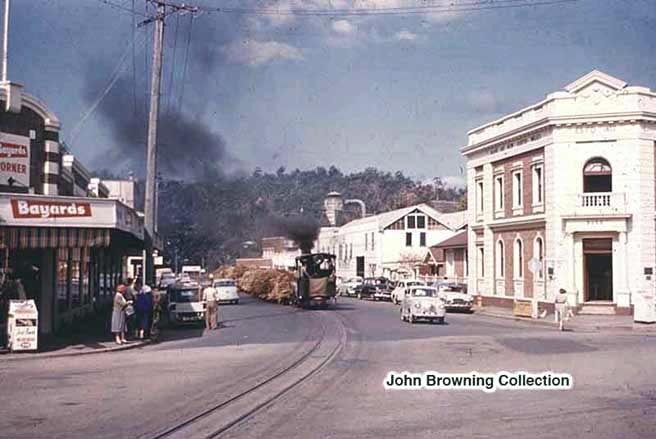 Coolum crosses Currie Street as it approaches the Mill with a load of cane, Royal George Hotel at right, 1960. 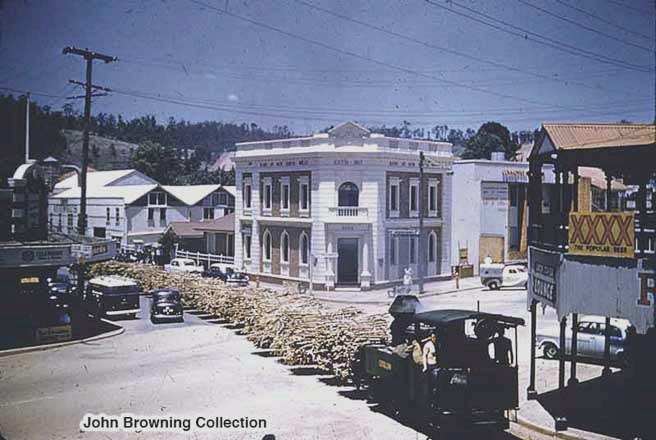 Long-time residents recall that sticks of cane on the trucks often brushed against the veranda post of the hotel as they went by, as the line was closer to the hotel than it is today. 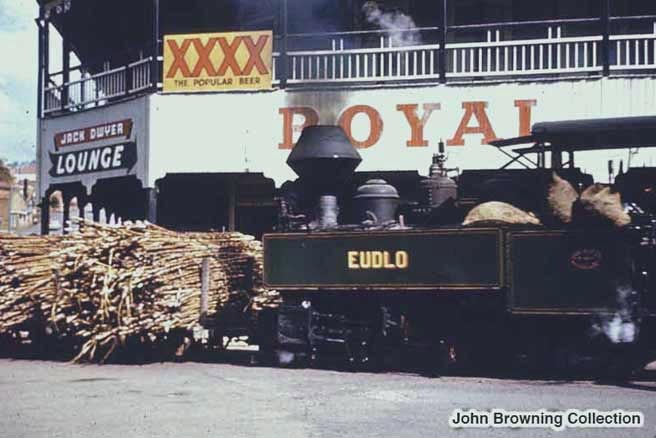 Eudlo passes the Royal George Hotel as it enters Mill Street, approaching the end of its journey. Note bags of coal on loco. The Royal George Hotel was burned to the ground soon after, on 15th February 1961, and was rebuilt in brick (see picture below). The intersection of Currie and Howard Street in 1965. 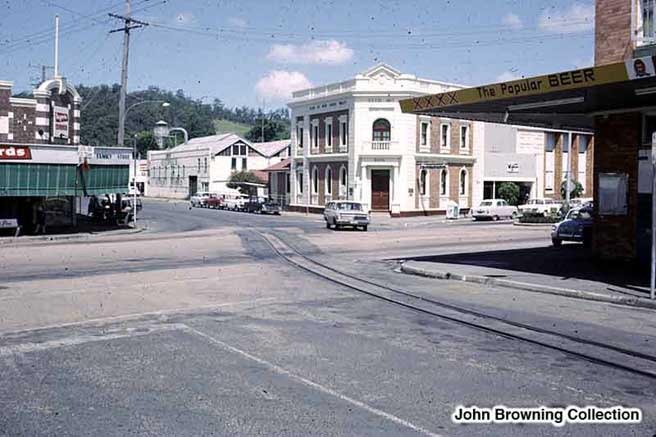 During the crushing season (July to December), up to 70 train movements per day crossed this busy intersection, which was the main road from Brisbane north, the Bruce Highway, until the Nambour bypass was constructed in recent years. 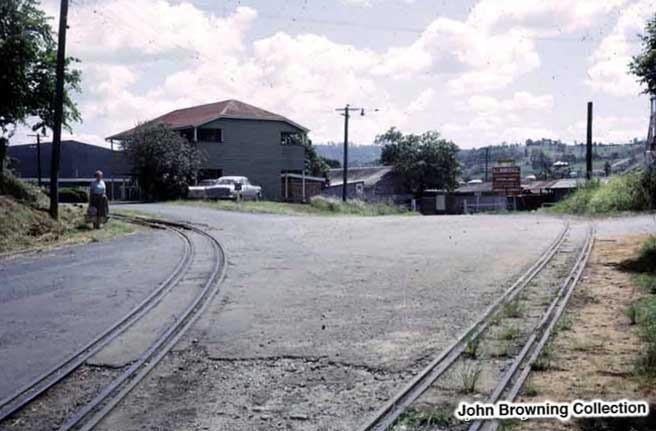 Portion of cane railway in Mill Street, Nambour, at the Mill entrance with old Mapleton Tramway line at right, 1965. 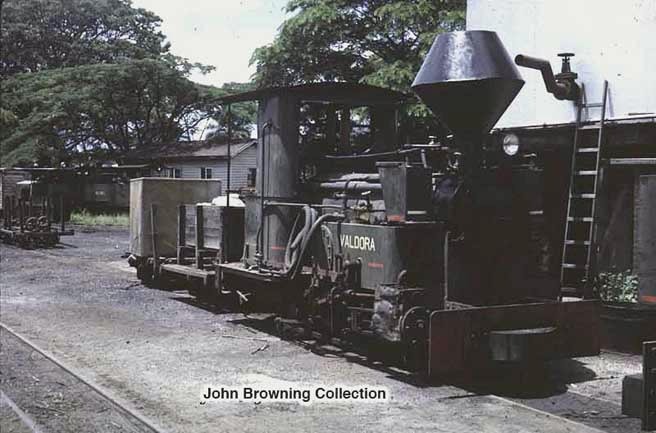 Click here to access more photographs from Mr Browning's collection, covering locomotives from other Queensland sugar mills.